Our church has for some time now been open to the idea that God speaks directly to people. 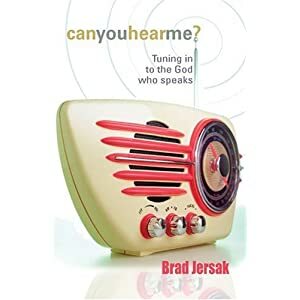 In recent times, this belief has become more pronounced through the counseling ministry of John Regier and Merve Tupplin, and also through Brad Jursak’s book “Can You Hear Me? : Tuning In to the God Who Speaks” This whole emphasis has been linked to a term called “listening prayer,” which seems to be a new movement which some have linked to the Emergent Church. My own journey with “listening prayer,” however, began when I was in my mid-teens. Upon reading a book called, “Help Me Remember Help Me Forget,” (an excellent read, by an ex-slave with a rough life, who learned to walk very closely with Jesus) I was exposed to the life of a person who daily lived in a conversation with God. I have sought this ever since and have, in a very small measure, achieved it – although I am continually seeking more. Along the way, I have found many pitfalls, and have found Scriptures exceedingly helpful in finding my way out of these many pits. The purpose of this post is to first prove that the Bible promises an internal voice of the Holy Spirit, and secondly the cautions which it gives along with that. Upon preparing to leave this world, Jesus consoles His disciples by reminding them that He will send in His place, the “Helper, the Holy Spirit, whom the Father will send in My name,” (John 14:26): Jesus will not leave His followers as orphans, but will come to them personally through the Holy Spirit (John 14:18). Immediately before ascending, Jesus told His disciples that they would “receive power when the Holy spirit has come upon you,” (Acts 1:8): they were told to wait in Jerusalem for this outpouring. This outpouring they did receive and, on the day of Pentacost the Holy Spirit was given to the Apostles and the church was born. Paul later makes it clear that the Holy Spirit belongs to all Christians, not just to the Apostles, (Ephesians 1:14). Virtually all Christians agree that all who are in Christ have His Holy Spirit in them. The question at hand, however, is whether this Holy Spirit speaks to us? It is certainly clear that God spoke “in many and diverse ways to the prophets,” (Hebrews 1:1): He identifies the normal means as through visions and dreams (Numbers 12:6). However, He is free to use other means – such as a burning bush or donkey – and He spoke to Moses “face to face, just as a man speaks to his friend,” (Exodus 33:11). We know, then, that God at times chose to speak directly to and through people. But are we living in a different time now? This is what was written about by the prophet Joel, “And it shall be in the last days, says God, that I will pour out My Spirit on all mankind, and our sons and your daughters shall prophecy, and your old men shall dream dreams…” (Acts 2:16-17). The Holy Spirit, then, continued to speak to and through His people in this new age: in fact, the very distinctive marking of this new age was that prophecy would no longer be reserved only for the kings/prophets. Rather, “Even on my bondslaves, both men and women, I will pour forth of my Spirit, and they shall prophecy,” (Acts 2:18). This reality was lived out in the life of the early church. Cornelius sent for Peter because of a vision and Peter made the crucial decision to preach to the Gentiles based on a vision he saw (Acts 10). Likewise, during a fast, the Holy Spirit said, “Set apart for me Barnabas and Saul [Paul] for the work to which I have called them,” (Acts 13:2). The Apostles conducted a lengthy discussion on the issue of Gentile inclusion: they prefaced their final recommendations by saying, “It seemed good to the Holy Spirit and to us…” (Acts 15:28). Paul was forbidden by the Holy Spirit to speak the word in Asia (Acts 16:6) but, upon seeing a vision, left immediately for Macedonia (Acts 16:9-10). Paul was later instructed to stay a long time in Corinth in a night vision (Acts 18:9-10). Paul was warned of his coming trial at Rome (Acts 21:11, etc.). He was encouraged during a storm en-route to Rome (Acts 27:24) by an angel, and John, as we know, saw an incredible vision of heaven which he wrote down as the book of Revelations. This smattering of Bible verses shows clearly that Joel’s prophecy came true – at least in the case of the Apostolic church, for whom the guidance of the Holy Spirit was at least a semi-regular occurrence. DO WE STILL HEAR GOD’S VOICE TODAY? We understand that there are some differences between the experience of the Apostles, and our own experience. Paul at one point mentions the “signs of an apostle” (2 Corinthians 12:12) which he performed among the Corinthians as proof of his apostleship. These signs are mentioned in Acts 2:43 and 5:12. At one point, Luke notes that even those who had Peter’s shadow pass over them were healed (Acts 5:15). In opposition to false teachers who fancied themselves “super-apostles,” Paul promised to come and show these hucksters up – not by testing their words, but their power (1 Corinthians 4:19). What exactly Paul had in mind is not stated: but it makes clear that he believed that to some extent, special miraculous power was to accompany a true Apostle. In 1 Corinthians 14:1, Paul says, “desire earnestly spiritual gifts, but especially that you may prophecy.” He goes on to describe prophecy in antithesis to speaking in tongues. When someone speaks in tongues, Paul explains, they are: 1) speaking only to God (v. 2), 2) declaring mysteries (v. 2), 3) edifying only themselves, and 4) not employing his mind (v. 14). Paul teaches that people are to follow his example in speaking in tongues only in private (18-19), and not to do so in public unless there is an interpreter. When people prophecy, however, he explains that they are: 1) speaking to men (v. 3) 2) declaring the secrets of peoples’ hearts (v. 25), 3) edifying, convicting, consoling (v. 3) and calling to account (v. 24), and employing their minds (v. 12-16). From Paul’s definition, it seems that prophecy is the spiritual gift of being able, on occasion, to hear God’s voice directly. The purpose of passing this information on to others is clearly the normal usage, but guidance such as the Apostles received for daily life does not seem to be excluded. Now that we know which category it falls into, we are better able to know what cautions God also attaches to prophecy. Prophecy is, by definition, a word from God enters the mind in some way – either by internal or external voice, by vision or dream or apparition or some other means – other than simply by reading or recollecting a passage of the Bible. Thus, prophecy is inherently a dangerous action, and we should not be surprised that Scriptures are clear in their warning about prophecy. Concluding his letter to the Thessalonians, Paul writes, “Do not quench the Spirit; do not despise prophetic utterances. But examine everything carefully; hold fast to that which is good; abstain from every form of evil.” (1 Thessalonians 5:19-22). Likewise, John instructs, “do not believe every spirit, but test the spirits to see whether they are from God, because many false prophets have gone out into the world” (1 John 4:1). There are at least three tests which are provided for the testing of spirits. In the passage noted above, John continues, “This is how you can recognize the Spirit of God: Every spirit that acknowledges that Jesus Christ has come in the flesh is from God, but every spirit that does not acknowledge Jesus is not from God. This is the spirit of the antichrist, which you have heard is coming and even now is already in the world,” (1 John 4:2-3). Likewise, Paul writes, “You know that when you were pagans, somehow or other you were influenced and led astray to mute idols. Therefore I tell you that no one who is speaking by the Spirit of God says, “Jesus be cursed,” and no one can say, “Jesus is Lord,” except by the Holy Spirit.” (1 Corinthians 12:2-3). Peter writes that, “Above all, you must understand that no prophecy of Scripture came about by the prophet’s own interpretation. For prophecy never had its origin in the will of man, but men spoke from God as they were carried along by the Holy Spirit,” (2 Peter 1:20-21). Paul further explains that, “All Scripture is God-breathed and is useful for teaching, rebuking, correcting and training in righteousness, so that the man of God may be thoroughly equipped for every good work” (2 Timothy 3:16). We should not assume that only the Old Testament is to be considered “Scriptures,” for in the following verse, Peter designates both his own, and Paul’s writings as Scriptures: “Bear in mind that our Lord’s patience means salvation, just as our dear brother Paul also wrote you with the wisdom that God gave him. He writes the same way in all his letters, speaking in them of these matters. His letters contain some things that are hard to understand, which ignorant and unstable people distort, as they do the other Scriptures, to their own destruction,” (2 Peter 3:16-17). By common consent of the Church’s ancient councils, the Scriptures which we now have constitute the Scriptures of the Christian religion – for our faith is build upon the apostles and prophets, with Christ as our cornerstone (Ephesians 2:20). Because these Apostles are no longer living, and because the necessary requirements for Apostleship (that is, seeing and knowing Jesus in the flesh, see 1 Corinthians 9:1) have been erased, the cannon has been closed. Parting ways with our Orthodox friends, we do not believe new prophets can write new Scriptures, but take the terrible words of Revelations 22:18 (“If anyone adds to the words of this book, God will add to him the plagues written in it…”) apply not only to Revelations, but the whole of Scriptures. We have thus established that there is a reliable, identifiable authority for life and faith – which is the Holy Bible. This book we take to be the very words of God. Unlike the prophecies of man, which are as straw, God’s Word burns like a fire and smashes like a hammer (Jeremiah 23:28-29). It, “is living and active. Sharper than any double-edged sword, it penetrates even to dividing soul and spirit, joints and marrow; it judges the thoughts and attitudes of the heart,” (Hebrews 4:12). While all humans will come and go like the grass, God’s word will endure forever (Isaiah 40:8, Mark 13:31). When the Bereans heard Paul, they proved themselves to be more noble not because they consulted some inner spiritual guidance, or even because they consulted right reason, but because they, “examined the Scriptures every day to see if what Paul said was true,” (Acts 17:11). In commending their example to us, Scriptures present themselves to us as the final authority for truth. This pattern is also exemplified in Paul, who wishes his readers “not to go beyond what is written,” (1 Corinthians 4:6), and he condemns anyone who presents a new gospel (Galatians 1). Scriptures, then, are to be the final authority, and the normal means of testing any spiritual manifestation or revelation. If a so-called “spirit of prophecy” is indicating a non-Biblical action, we must conclude that this is a false spirit, or a spirit sent from Satan. In the passage where Paul speaks most of prophecy, he also provides the third manner of testing: the authority of the church. In 1 Corinthians 14:29, he writes, “Let two or three prophets speak, and let the others pass judgment.” In so saying, he makes it clear that prophecies are to be at least partially a communal event. It is my belief that the elders of the church are especially in view here, although the rest of the congregation should not be excluded. All are to listen carefully to a prophecy, then “pass judgment” over whether they believe this prophecy is from God or not. As I re-read this passage, two things seemed very clear to me: first, prophecy is linked to “judgment” here just as surely as tongues is linked to “interpreters.” Do you have no interpreters? Paul doesn’t want you speaking in tongues. Do you have no one capable of judging? It does not seem that Paul would want prophecy without judgment: the two are intrinsically linked. The second thing which seems likely to me is that the prophets don’t lead the church – that is for the elders and apostles (1 Corinthians 12:28). This simple rule would have prevented many cults from forming: it is simply BAD to have a prophet in a place where what they say cannot be questioned, since prophecy is inherently subjective, and people can be honestly or dishonestly deceived when they attempt to prophecy as a “solo-act,” without any “judgment” or secondary input into their words and thoughts. In our context where we don’t have regular communal prophecy and judgment of it, I believe that the best way to honor this principle is to take one’s “prophetic” revelations to one’s mentors and pastors. These people will likely be able to confirm or reject a prophecy, based on their experience with you and God’s voice over you as they pray for you. In the immediately following verse, Paul writes, “But if revelation is made to another who is seated, the first prophet must keep silent.” So, if one person is standing, giving a prophecy, and another begins to prophecy, the first must sit down. What is the purpose of this? Only that in a group of people, where one person stands up and begins a prophecy, God is at liberty to use another person to either continue the prophecy, or to silence the first prophet. Thus, a person who is fully convinced that they are a prophet anointed by a message may be silenced within a few words, by another prophet who stands up to speak. The purpose of this seems to be that the first prophet may have been mistaken in thinking they were to prophecy or – since “the spirits of prophets are subject to prophets,” (1 Corinthians 14:32) that person may have added something of his own to the prophecy. This verse, then, gives God the freedom to correct the first prophet through a second. The practical application of this is that one must always remember that just because God speaks through someone, that does not make that person in any way infallible, or perfect. God is fully capable of speaking through corrupt and wicked men – or, for that matter, through their pets (see Numbers 22)! God knows our frame: he knows we are but dust (Psalm 103:14). He is very much aware that even though it should not be the case, it very often is true that out of the same spring often flows both good and evil waters, both blessings and cursings (James 3:11). We should never forget that immediately after Peter was blessed for making one of the most spectacular and important prophecies of all time (“You are the Christ, the son of God!” Matthew 16:16), he was rebuked and called Satan for setting his mind on earthly things and not heavenly (Matthew 16:23). A literal application of this principle will not likely happen often. Since very few people prophecy, it is much less likely that two people with the gift of prophecy will be in the same time at the same place, in order to cut one another off. However, I think the practical applications of this principle is among the most important, which is that that prophets should never NEVER forget that even when they think they are speaking from God, they may be wrong. Thus, people who believe they have a prophetic utterance should always treat their prophecies with caution. Perhaps one way of doing this would be to say, “I think God wants me to say this to you….” rather than, “This is what God says!” This would be especially appropriate when a person has not tested their prophecy by submitting it to the “judgment” of others before delivering it to the recipient. Upon hearing the word “prophecy,” many non-Charismatic Evangelicals react negatively. However, I believe they would be surprised to see how often they do “prophetic” things without knowing it. How often, for example, has a preacher said something to the effect of, “I know I don’t have a Bible verse for this, but as I was studying this passage and praying about our church, I felt impressed to say….” Is that not prophecy? He has just admitted that this revelation comes not from Scriptures, but from The Spirit as he has been praying. Also, how many people have – at a crucial juncture of life – had a dream, or a mental image which was powerful in guiding their decision? Most commonly and perhaps most importantly, when people say, “I just don’t have peace over this decision,” or “Yes, I think this is right. I have a lot of peace about this…” aren’t they really seeking God’s will through His internal witness, or through “listening prayer”? A church which decides, “We are not charismatic. We only read the Bible. We don’t talk about the Holy Spirit” will not in this way prevent people from using and perhaps abusing the gift of prophecy. On the other hand, churches which utilize prophecy openly, excitedly and without the boundaries which the Bible puts in place are likely to fall into many pitfalls associated with false prophecy. Rather, I think the best way is always the Bible’s way. Let us not despise, but rather earnestly seek after the gift of prophecy. Only, let us not forget the warnings and tests which God has put in place, to keep us safe in our use of this gift. In this way, we may have all of the blessings which God intended for us to receive, while still retaining the security and safety which He also intended for us to have. I am charismatic with sign gifts (the woo hoo kind some are concerned about), so I agree with you and go even father. And I know about what others have called “charismania” which is flouting such things as if they made one a better Christian or a better church, which is not the case at all. All this needs to be done decently and in order. And of course there are frauds and false prophets seeking gain. So one needs to approach this with eyes open. Doubt is a part of my faith. I am a student writing a research paper on this topic. I could not pinpoint your view on whether the gift of prophecy is given to ALL Christians or not. Not all Christians prophecy, but all can and should. This is why Paul says, “Pursue love, yet desire earnestly spiritual gifts, but especially that you may prophesy.” (1 Cor. 14:1). Let me know what you conclude! You could paste a summary, or the paper in full as a comment to this post. I would read it.